With all the different riflescope mounts and rings and rails out there, it may be confusing keeping them all straight and what the difference is. After all, we think of the rifle, the fire-power, the optics and other accessories. One more important piece for your performance that you may not even think of, however, is the scope mount, and there really are numerous options even for these out there. The performance of your rifle in unison with your scope depends entirely on the proper mount. That said, what is a cantilever mount? Let’s find out, so the next time you come across one of these, you will know exactly what it is, how it works, the pros and cons and if this is an option you want for your rifle. For mounting your scope, I have heard many times the terms mounts, rings and rails sort of used interchangeably, but there is a difference. The rail is the base that your “mount” is attached to. Generally, you will have a base that is either a Weaver style, Picatinny, Dovetail or a combination. Rings and mounts are basically the same things, but a mount is a single piece and rings are two-pieces. Mounts and rings will mount to your base rail, which can also be a one-piece or two-piece. There are three main types of bases out there: Weaver, Picatinny, and Dovetail. Weaver is one of the most common bases. It is a flat rail with crosswise slots that help to prevent /movement due to recoil. It is 7/8-inch wide and will only accept Weaver style rings. The cool thing about Weaver rings is that they are easily detachable and re-attachable to the base without having to remove the scope. The Weaver and the Picatinny are very similar. Picatinny bases are the most versatile as they can adjust to many different scope lengths, can accommodate both right and left-hand receivers and can accept both Picatinny and Weaver mounts. They also come as a one-piece or two-piece base and are easy to install due to factory pre-drilled holes and screws. 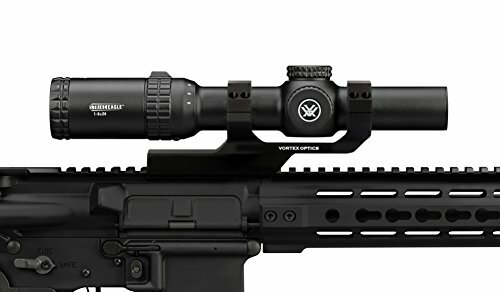 This style of base can hold many other accessories other than just the scope, and on some tactical rifles can be installed on several different places on the gun. Dovetail bases are one of the oldest systems of bases out there and are very heavy duty. They are usually heavier than the other style bases and much sturdier. A Dovetail base has an oval hole in the center and the rings have a “dovetail” shaped pin that fits down into that hole, then is twisted and locked down tight. One-piece mounts are typically stronger and more rigid, thus offering more support and stability for your scope. The rings are automatically aligned so you won’t necessarily have as many adjustment issues as you might with the two-piece ring style. They offer a little bit more height and are a great option for a tactical rifle. The disadvantages of a one-piece mount are that it is heavier and can get in the way of the receiver on bolt action rifles. This could make it more difficult to clear misfires and malfunctions, and loading rounds directly into the chamber. You must also be aware of the alignment of the drilled holes for the optic. If the holes are misaligned it can cause mounting and other problems with the scope and recoil factor. Two-piece rings are lighter in weight and allow for more clearance between the body of the scope and the receiver so jams can be cleared more quickly. They are usually a better option for hunters for this reason. They are generally more common and more affordable and offer a little bit lower mount onto your firearm. They do need to be aligned properly to one another, but they are easy to align. Another bonus is that they are usually easily interchangeable between rifles whereas a one-piece may not be. The word cantilever is defined as a long projecting beam or girder fixed at only one end, so you can probably guess which is a cantilever mount when lined up against others, as it protrudes forward on one end. Cantilever mounts can be either a one-piece mount or two-piece rings. In either style, the mount pushes the scope forward and allows for more rail space behind the optic. This is nice in case you want to mount something else back there, like a magnifier. Also, pushing the optic forward like that gives you better eye relief and a larger field of view to work with. Instead of over the receiver, a cantilever mount will sit a bit more over the barrel. This can change the balance or weight of your rifle and make it more front heavy, so keep this in mind when coupling with a scope as some scopes can be quite heavy. They also add some height to your scope, which could be an advantage or disadvantage depending on how you shoot your rifle. As with other accessories and fittings for your gun, even a cantilever scope mount comes with multiple options and features depending on how fancy you want to get. If the tactical forward projection isn’t enough, you can also get these mounts with a quick release, see-through for easy co-witnessing, extra rails for mounting stuff on top of your rings such as a green light, or a combination of these features. An example of a cantilever mount with all of these options would be the Mizugiwa quick release mount. You should now be familiar enough knowing what a cantilever mount is to be able to identify it, know the pros and cons, and some of the different features. With this knowledge, you will be able to make a better decision as to if this is the kind of mount you want or need on your rifle. Whichever you choose, choose one to make your shooting better and your life easier!